We offer a great range of activities for your children to enjoy! For us, there is nothing better than seeing families spending quality time together in our clubs. We’ve developed a huge range of activities that you can all enjoy, both individually and together. Our social calendar is full with family friendly events and our DLicious cafebar is a great place to enjoy a family meal together. We’ve got plenty of activities that will keep the kids happy and we even do parties and events for special occasions. So whether you want to relax, have fun or enjoy some quality time together, we’ve got the whole family covered. Our DLicious cafebars have a space for everyone! We have family areas, Adult Only lounges, beautiful outdoor terraces areas, and even Business Hubs allowing you to get on with some work, using our free Wi-Fi. The DLicious cafebars are an ideal place for meeting friends for a coffee or a meal from our menu. With high quality, fresh ingredients, the menu has a balanced choice of meals and snacks that are ideal for a healthy active lifestyle and will leave you feeling more energized all day. Spending a family day in David Lloyd Clubs is fun for all, as we’ve got activities that give everyone in your family lots of healthy, active fun. Whether you fancy a game of parents versus kids tennis, or a quick splash in the pool, you’ll have plenty of choice. And, when you head back to the DLicious cafebar to refuel, the kids will love climbing around on the soft play frame. Our DL Kids programs are a great way to keep your kids active, whilst having lots of fun. We’ve deliberately timed the sessions to match up with our group exercise classes, so you can attend a class or enjoy a quiet coffee while they play a sport, have fun making arts and crafts or enjoy some games. DL Kids is a really brilliant way to keep the kids running around, learning new skills and sports all whilst having fun and making new friends. Whatever their age, we have plenty going on to keep your kids busy. Our crèche team love looking after our youngest members, whilst you enjoy some me time in the club. As well as our DL Kids programme, we run some brilliant swimming and tennis sessions that your children will love. They’ll be taught by our expert instructors, learn some great new skills, and make new friends at the same time! If you want to make your child feel extra special on their birthday, look no further. 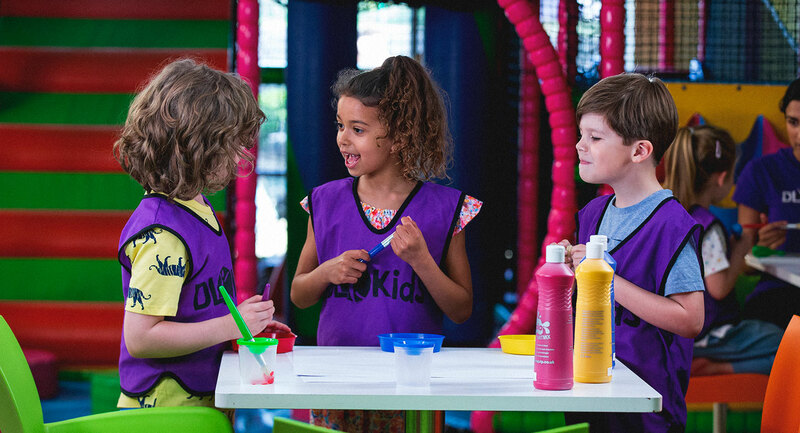 Our brilliant teams can throw birthday parties that all the little ones will love! We also run a range of events in our clubs throughout the year for our members to get to know each other and have some fun. Keep a look out, as we post information around our clubs about what’s coming up!